We offer alloy steel pipe fittings for different industrial applications. 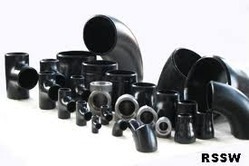 Our assortment is procured from reputed manufacturers who used excellent quality alloy steel in fabrication of various pipe fittings like reducers, elbows, bends, tees, flange, nut, bolts, stud. These pipe fittings supplied by us are known to be durable and rust proof. • ASTM / ASME SB 336. UNS 2200 (Nickel 200), UNS 2201 (Nickel 201), UNS 4400 (Monel 400), UNS 8020 (Alloy 20 / 20) CB 3, UNS 8825 Inconel (825), UNS 6600 (Inconel 600), UNS 6601 (Inconel 601), UNS 6625 (Inconel 625), UNS 10276 (Hastelloy )C 276.